RISD Glass initiated Hotnights as a means of cultivating a greater understanding of glass and its significance to an array of disciplines. 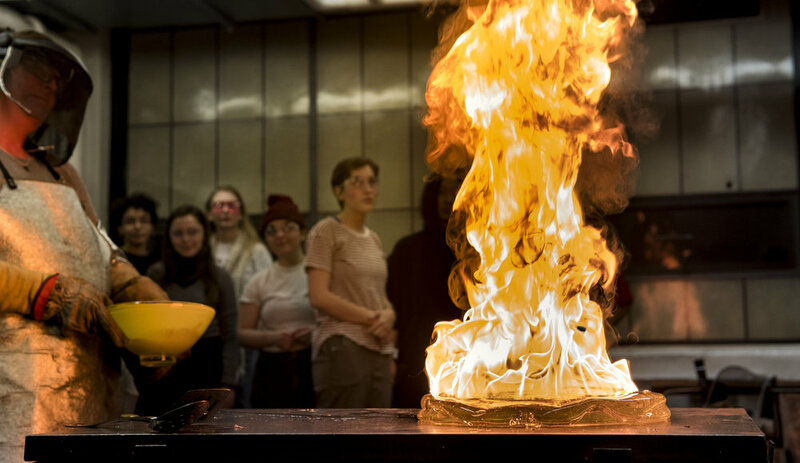 Through a series of hot shop demonstrations, projects, and workshops, Glass faculty and students partner with the larger community to research and experiment the intersection between glass and its ubiquitous presence in the world. Hotnights has led to significant developments combining emerging digital fabrication technologies with traditional glass processes, investigations of optical properties of glass and light, and has collaborated with student groups to assist in the fabrication of ambitious cross-disciplinary projects amongst others. In this studio/seminar, co-taught by a RISD artist and a Brown historian, we will examine how material attains meaning. Through demonstrations, workshops, lectures, and hands-on making, we will explore instruments used to understand materials in 16th and 17th-century Europe (e.g. microscopes, alchemical alembics, printed books). We will also consider how those devices have inspired contemporary art practice. Final projects, which may take a variety of forms, will interrogate the relationship between matter and the devices used to understand it. This research group was organized around the theoretical and technological aspects of Optics with an emphasis on its relationship to Glass. We explored the implications of Optics in realms such as; projection, magnification, perception, imaging, as well as, its role in media. Both historical and contemporary content and approaches were encouraged. The group met weekly for discussion, lectures, "hands-on" experiments and material investigations. While lectures and demonstrations were conducted by faculty and special visitors, the direction of our research from week to week was driven by the research that the group brought forth. This was a semester long research study group focused on Alchemy and Glass. As a discipline and a material, Glass is inherently connected to Alchemy. Their combined histories have shaped our understanding of the relationship between material and meaning, the role of process in art and science and, ultimately, the ways in which making shapes knowledge. One of the goals of this research group was to explore the conceptual and material potential of Alchemy through Glass. Our research combined the examination of practical, theoretical and historical texts along with "hands-on" experiments in Glass Department Shops. The group met weekly for discussions, research presentations, lectures and working/lab sessions. As the semester progresses the direction of our research was determined by the materials brought forth by the group.